This work of the painter Alessandro Allori is considered one of the best in the artist’s work. Angel is used in the Bible in various meanings: in relation to the Son of God, Jesus Christ, and towards people – prophets, priests and bishops of churches, and in relation to soulless objects and phenomena of nature, when they are messengers of God’s wrath. In the New Testament, angels serve Jesus Christ and his teachings: proclaim and glorify the birth of the Savior, serve Jesus after the temptation in the wilderness, announce the resurrection and ascension of Christ, are apostles, take an active part in the future Judgment Day, etc. About the angels says in his speeches and sermons of Jesus Christ, the apostles write about them in their writings and gospels. 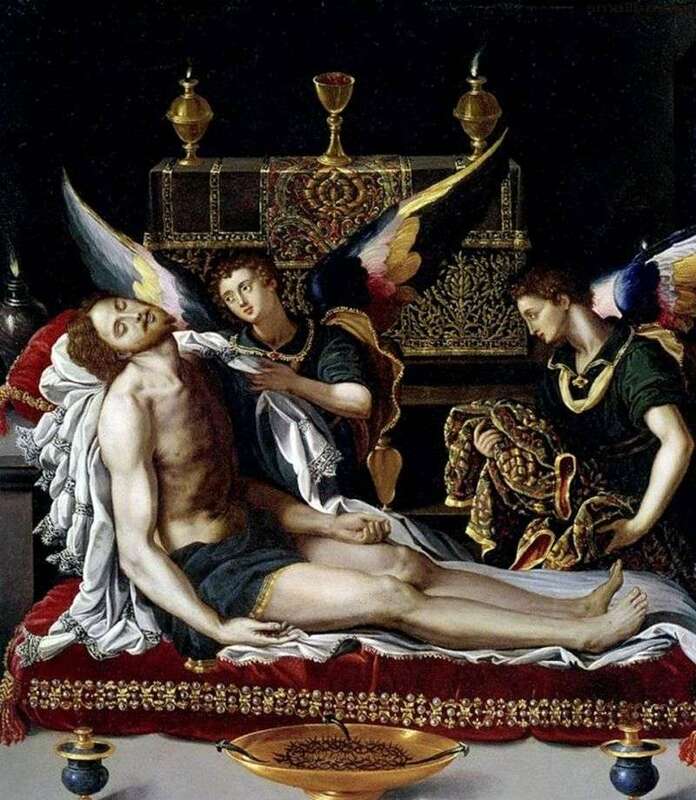 The image of the angels was the subject of art even in the Old Testament: the winged cherubs were depicted on the Covenant of the Covenant; In the Solomon’s temple, two large cherubim with wings covered the whole space occupied by the Ark in the Holy of Holies. The prophet Ezekiel in the famous vision of the chariot depicts angels as humanoid, with four faces and four wings; Their feet are with the feet of a bullock and are as shiny as copper; with the face of a man a lion’s face joined on the right side, and a calf and an eagle on the left; Two wings they flew, and two covered their faces and so on. Less complex is the symbolism of the prophet Isaiah in depicting angels, but still the symbolism is plentiful. The ancient Christian art in the depiction of the angels held special simplicity. The now accepted image of angels in the form of naked children or just a head with wings, but without a body was then not known. Ancient art depicted the angels in the form of mature young men in a tunic, strapped around the waist with an orarion. In the first centuries of our era the angels were portrayed in the form of ordinary people. This is known from church writers and from the surviving monuments of art. Since the IV century in Christian art there is still a very weak desire to distinguish the images of angels from mere mortals. Unlike humans, angels begin to impart shining radiance and wings to the images. Even in the fifth century this form of depiction was not defined yet, and the angels are depicted either with radiance, or only with wings. Then, from the 6th century, painters begin to portray angels in the form of a wanderer with a staff in their hands. Since the VIII century already depict angels with wings, radiance and staff, the staves sometimes end in crosses. Description and meaning of the painting Two angels at the body of Christ by Alessandro Allori.